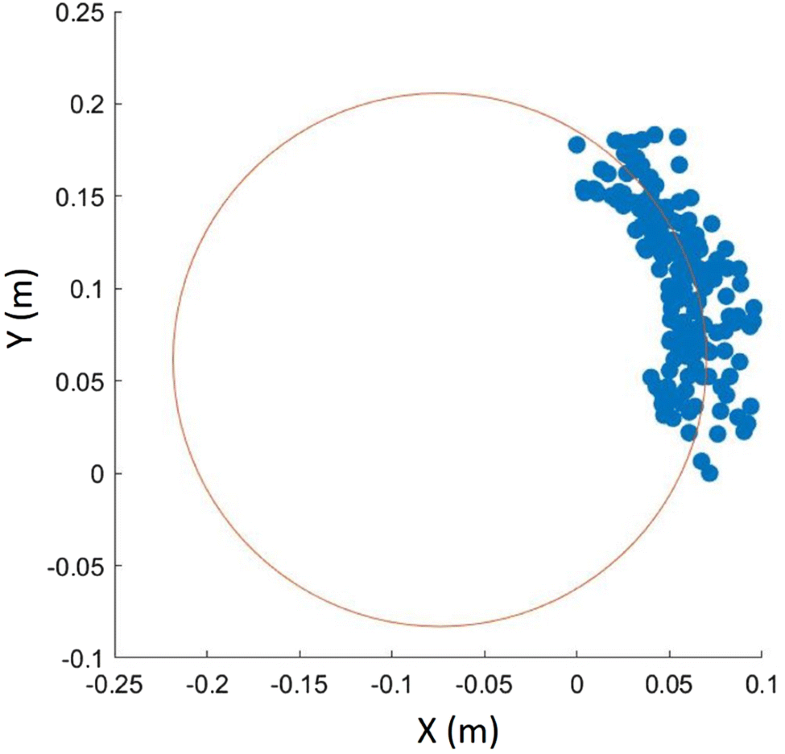 Because trees can positively influence local environments in urban ecosystems, it is important to measure their morphological characteristics, such as height and diameter at breast height (DBH). However, measuring these data for each individual tree is a time-consuming process that requires a great deal of manpower. In this study, we investigated the feasibility of using mobile LiDAR to estimate tree height and DBH along urban streets and in urban parks. We compared measurements from a mobile LiDAR unit with field measurements of tree height and DBH in urban parks and streets. The height-above-ground and Pratt circle fit methods were applied to calculate tree height and DBH, respectively. The LiDAR-estimated tree heights were highly accurate albeit slightly underestimated, with a root mean square error of 0.359 m for the street trees and 0.462 m for the park trees. On the other hand, the estimated DBHs were moderately accurate and overestimated, with a root mean square error of 3.77 cm for the street trees and 8.95 cm for the park trees. Densely planted trees in the park and obstacles in urban areas result in “shadows” (areas with no data), reducing accuracy. Irregular trunk shapes and scanned data that did not include full data point coverage of every trunk were the reasons for the errors. Despite these errors, this study highlights the potential of tree measurements obtained with mobile terrestrial LiDAR platforms to be scaled up from point-based locations to neighborhood-scale and city-scale inventories. Trees in urban areas support urban ecology by promoting biodiversity, carbon storage, and urban temperature reduction. Trees in the city promote biodiversity by providing small habitats and by linking fragmented habitats caused by urbanization (Watts et al. 2010; Lerman et al. 2014). While urban heat islands increase temperatures (Shin and Lee 2005), urban trees reduce heat stress by providing shade and enhance radiant energy reflection by increasing albedo (Jim 2012). In addition, while carbon emissions from cities are accelerating, urban trees provide carbon sequestration by storing carbon as biomass (Nowak and Crane 2002). Quantifying tree structure is an important aspect of understanding how trees affect urban ecology. The effects of trees have been studied at various scales, such as the forest, park, and individual tree levels. For example, the influences of green space shape and size on biodiversity (Watts et al. 2010; Yuan et al. 2014; Canedoli et al. 2018) and urban temperature reduction (Lee et al. 2009; Kong et al. 2014; Lin et al. 2015; Park and Cho 2016) have been quantified in many studies. The effects of the vertical structure and the horizontal distribution of green spaces were also quantified in relation to urban biodiversity (Nielsen et al. 2013; Lerman et al. 2014; Rush et al. 2014), heat reduction (de Abreu-Harbich et al. 2015; Park et al. 2018), and carbon stock (Anaya et al. 2009; Song 2013). In individual-tree-level studies, detailed information about individual trees is obtained. The leaf area index (LAI), leaf area density (LAD), crown width, tree height, and diameter at breast height (DBH) are indicators quantifying the morphological characteristics of trees and are either measured or estimated for use in research. 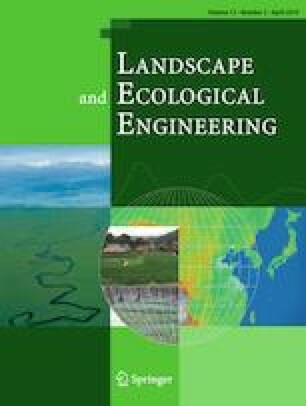 LAI and LAD have been applied to compute the radiation transmittance of urban trees (Oshio and Asawa 2016) and heat stress reduction (Park et al. 2018). Crown width, tree height, and DBH have been employed to estimate carbon stocks (Nowak and Crane 2002; Yoon et al. 2013; Zhao et al. 2018) and wildlife habitats (Nielsen et al. 2013; Pagani-Núñez et al. 2017). However, acquiring data from each individual tree is a time-consuming task that requires a great deal of manpower because it is necessary to measure each tree in the research area. To increase the efficiency of data acquisition, a remote sensing method has been developed. Light detection and ranging (LiDAR), a type of remote sensing, can be used to acquire morphological characteristics of trees. Utilizing airborne and terrestrial LiDAR data, LAI and LAD (Hosoi and Omasa 2006; Béland et al. 2014; Oshio et al. 2015; Dutta et al. 2017), crown width, tree height, and DBH (Yao et al. 2011; Dutta et al. 2017) have been computed. Although airborne LiDAR can be used in large-scale studies, elements such as DBH cannot be calculated directly with airborne LiDAR due to its low resolution. Terrestrial LiDAR can be used to directly calculate variables such as DBH, but it is not efficient to apply this technique in large-scale studies. Mobile LiDAR, which can be mounted on vehicles, backpacks, and UAVs (unmanned aerial vehicles), and is capable of scanning while moving, is an alternative to terrestrial LiDAR that allows effective data collection over wide ranges. Due to this advantage, DBHs and tree heights have been estimated using mobile LiDAR at the forest scale (Fan et al. 2018; Pierzchała et al. 2018) and the urban street scale (Zhao et al. 2018. In urban street conditions, there are obstacles such as cars and pedestrians to contend with when scanning using mobile LiDAR. Unlike along a street, trees are not planted at regular intervals in a park, and there are other obstacles such as rides and other facilities. However, little is known about DBH estimation in urban parks using mobile LiDAR. In the research reported in the present paper, we calculated DBH and tree height for street trees and trees in small parks using mobile LiDAR in order to answer a number of questions, including the following. (1) How accurate is DBH and tree height estimation using mobile LiDAR? (2) What are the factors that decrease the accuracy of DBH and tree height estimation using mobile LiDAR? (3) How does DBH and tree height estimation differ depending on whether the trees are in a street or a park? In this study, tree height and DBH were calculated along a street and in a small urban park. Trees in a street in Seoul National University, Gwanak-ro 1 Seoul, South Korea (37.57142°N, 126.9658°E) were selected for study (Fig. 1a). This street was 100 m in length and 11 m in width, including sidewalks, and there were 15 trees on both sides. 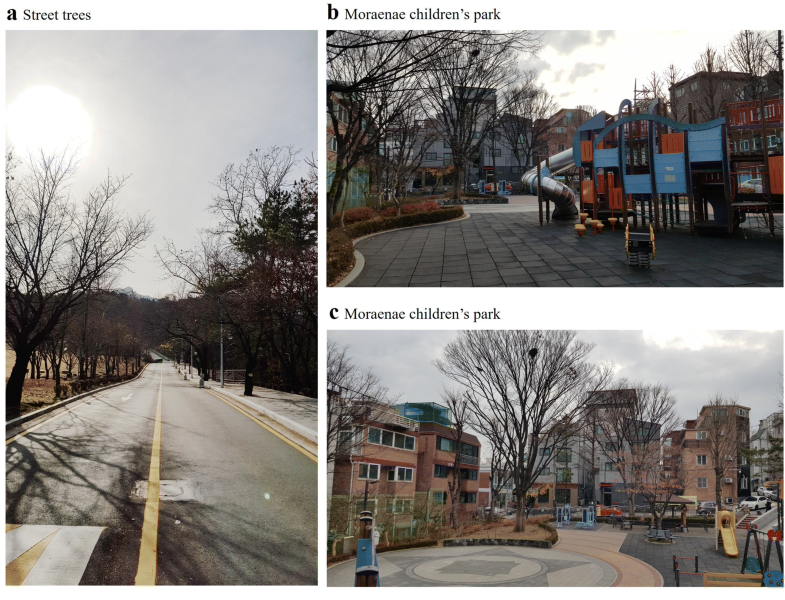 Trees in the Moraenae children’s park located at Gwanak-ro 12–55 Seoul, South Korea were also selected for study (Fig. 1b, c). This park was 30 × 50 m in size and contained 39 trees. Mobile LiDAR data from the street and the park were collected on December 1, 2018, while field data were collected on December 3, 2018. During the field survey, specific information on urban trees, including DBH and tree height, was obtained. Point cloud data on the street and park were collected by a Stencil laser scanning system, which is a standalone simultaneous localization and mapping (SLAM) algorithm-based real-time three-dimensional mapping device produced by Kaarta. To scan the road trees, a person carried the mobile LiDAR in the center of the road from one end of the site to the other end of the site. To scan the park trees, we designed a scan path, as shown in Fig. 2. We compared the tree structure data obtained using the mobile LiDAR with physical measurements we took in the field. The DBH and height of each tree in the research area were measured with a DBH ruler and Vertex hypsometer, which is produced by Haglof. The Vertex hypsometer is a device that is often used for tree height measurements in both forested and urban areas (Hopkinson et al. 2004; Yoon et al. 2013). Trees with DBHs of at least 4 cm have been studied using terrestrial LiDAR by Olofsson et al. (2014). In another study conducted in Korea, trees with DBHs of at least 6.2 cm (Seo et al. 2015) and 4.8 cm were considered when estimating the biomass in forests and urban areas, respectively (Jo and Ahn 2012; Jo et al. 2013). In the present study, trees with DBHs smaller than 5 cm were excluded from the analysis, resulting in the exclusion of 8 trees. As a result, 15 and 39 trees were measured along the road and in the park, respectively. Three preprocessing steps were carried out on the mobile LiDAR data. All preprocessing steps were performed using the CloudCompare software (version 2.9.1). First, noise was removed using a noise filter tool. We applied a radius of 0.3 and a max error-relative of 1.0 as optional parameters. Second, ground classification was performed. We used a CSF filter for ground classification, and the flat option was applied. Third, the trees in the study area were classified manually and the tree data were segmented into individual trees. Although several automatic tree classification techniques have been developed and have been shown to be highly accurate, the data had to be postclassified manually due to incomplete classification (Zhao et al. 2018). Therefore, we manually classified and segmented the trees. We calculated the tree height using the height-above-ground method. The height above ground was calculated by subtracting the height value of the highest point in the tree point cloud from the height value of the ground surface. The height-above-ground calculation was performed using the cloud/mesh distance tool in the CloudCompare software, and the maximum height above the ground of each tree was computed using MATLAB 2018b. 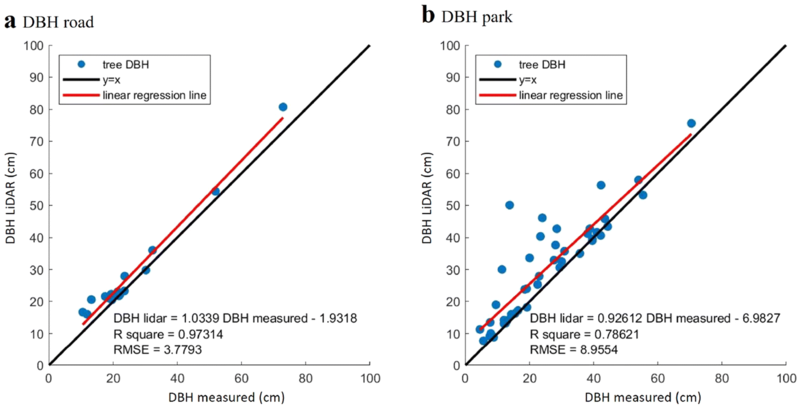 DBH refers to the diameter of a tree trunk measured at a height of 1.2 m. The point density of mobile LiDAR scanned data is lower than that of terrestrial LiDAR, meaning that the shape of the trunk cannot be extracted from LiDAR data obtained at a height of 1.2 m. Therefore, in this study, the DBH was calculated for each tree based on LiDAR data for points 1.19–1.21 m above the ground. Many studies have been carried out to measure the DBHs of trees using terrestrial LiDAR (Côté et al. 2011; Huang et al. 2011; Yao et al. 2011). However, the mobile LiDAR data used in this study provided incomplete information on tree trunks because full point coverage could not be obtained for some tree trunks (Fig. 3b). We therefore needed a method that could use the incomplete data to extrapolate the missing information. The method we chose to do this was a least-squares circle fitting method (Pratt 1987). The higher the R2 and the lower the RMSE, the higher the accuracy. R2 and the RMSE were calculated for each study site and calculated for both DBH and tree height. Figure 4 shows the collected mobile LiDAR data that preprocessing was performed on. A small number of points were obtained at the tops of trees as compared to the bottoms of trees. 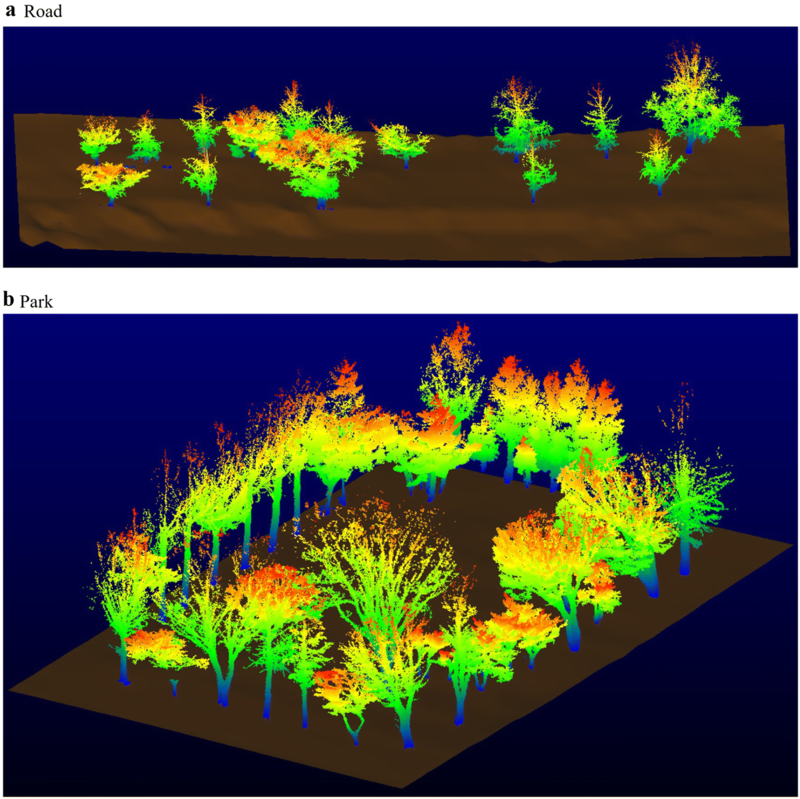 This is because mobile LiDAR has a low vertical field of view (FOV) of 30 and the lasers used in LiDAR were blocked by surrounding tree crowns. There were 15 and 39 trees along the road and at the park, respectively. We first extracted the tree heights from the height-above-ground values. 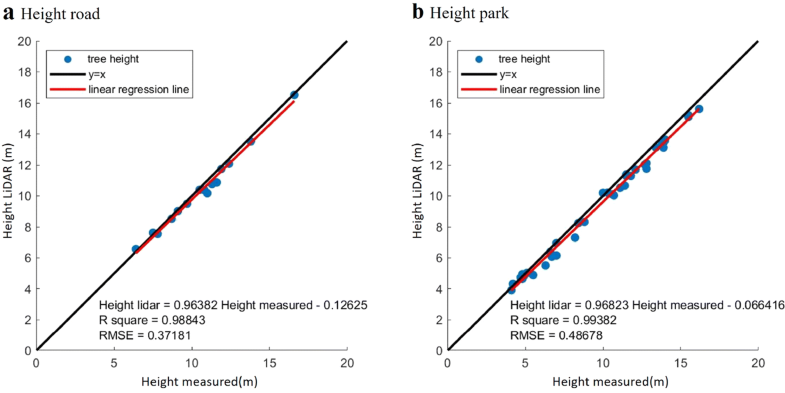 To assess the accuracy of the tree heights estimated using LiDAR, they were compared to the corresponding measured tree heights (Tables 1 and 2). Along the road, the mean difference between the measured and estimated heights was 0.24 m, and the maximum error was 0.8 m. In the park, the mean difference between the actual and estimated heights was 0.4 m and the maximum error was 1 m. Errors were therefore slightly higher for the trees in the park than for the trees along the road. We computed the DBH value(s) extracted from the point cloud of each tree at 1.19–1.21 m. In contrast to the tree height, there were multiple DBH values for some trees as the trunks of those trees split less than 1.2 m from the ground. We measured and estimated the DBHs of all the trees. To assess the accuracy of the LiDAR-estimated DBH values, they were compared to the corresponding measured DBH values (Tables 3 and 4). Along the road, the mean difference between the measured and estimated DBHs was − 2.79 cm, and the maximum error was − 7.7 cm. In the park, the mean difference between the measured and estimated DBHs was − 5.6 cm, and the maximum error was − 36.3 cm. Errors were much higher for the trees in the park than for the trees along the road. We also evaluated the accuracy of the results obtained with LiDAR by calculating the root mean square error (RMSE) and the correlation coefficient (R2). For the tree heights, as shown in Fig. 5, the correlation coefficient was 0.963 and R2 was 0.988 along the road, and these values were 0.968 and 0.993, respectively, at the park. The RMSE was 0.359 m along the road and 0.462 m at the park, indicating that there was a strong correlation between the measured and estimated tree heights in both study areas. Although there were some errors in the LiDAR-estimated values at both sites, most of the estimated tree height data were considered to be very accurate. For the DBH values, as shown in Fig. 6, the correlation coefficient was 1.033 and R2 was 0.973 along the road, while these values were 0.926 and 0.786, respectively, at the park. The RMSE was 3.77 cm along the road and 8.95 cm at the park. There was a strong correlation between the measured and estimated DBHs for trees along the road. However, compared to the estimated tree heights, there was a relatively weak correlation between the measured and estimated DBH values for the park trees. In this study, we estimated the heights and DBHs of trees using mobile LiDAR and evaluated the accuracy of those measurements by comparing them with corresponding field-based measurements. Unlike terrestrial LiDAR, mobile LiDAR can be used to scan a large area, enabling the generation of city-scale data sets. This study evaluated the potential accuracy of the scaled-up data sets facilitated by mobile LiDAR. We found that it was possible to calculate the heights and DBHs of trees along streets and in parks in urban areas using mobile LiDAR with a high degree of accuracy. Mobile LiDAR has other advantages in addition to its ability to cover large areas when compared to terrestrial LiDAR. LiDAR measurements in urban areas are more challenging than those in a forest due to the presence of other urban obstacles, which result in shadows, i.e., areas with no data (Bonnaffe et al. 2007). For instance, cars passing by or parked on the street can block scans of tree trunks, as can people on the street or at the park. In this case, performing terrestrial LiDAR scanning from certain points results in shadows, whereas LiDAR measurements are carried out on the move in mobile LiDAR, making shadows far less likely. Nonetheless, the presence of obstacles lowers the density of the data point cloud obtained with mobile LiDAR and thus reduces the accuracy of the final estimated values. There were factors that decreased the accuracy of the estimated tree heights and DBHs. The estimated tree heights were generally slightly underestimated compared to the measured tree heights in both areas (Fig. 5). The errors in the estimated tree heights were larger when the trees were taller. This underestimation is likely related to the low data point density at the tops of the trees in mobile LiDAR data. Because mobile LiDAR has a smaller vertical FOV, the upper part of a tree can only be scanned far from the tree, which results in a lower point density. The low point density at the top of the tree means that the mobile LiDAR is unlikely to scan the very highest part of the tree. For instance, Hopkinson et al. (2004) calculated tree heights from ground-based LiDAR data and found that the values were underestimated due to foliage obstruction, particularly for tall trees. Unlike tall trees, scans of small trees were relatively accurate because mobile LiDAR scans are less likely to be blocked by tree crowns. In contrast to tree heights, the estimated DBHs were generally slight overestimates compared to the measured DBHs (Fig. 6). As the average error in the estimated DBH indicated, the estimated DBHs were generally larger than the measured DBHs in both study areas. Irregularly shaped tree trunks and incomplete point clouds around trunks are likely the reasons (Fig. 7c). The DBH can be estimated with great accuracy when the tree has a circular trunk (Yao et al. 2011; Fan et al. 2018). Contrary to Fan et al. (2018), we think that our results are biased because the tree stems observed in this study did not present a uniform circular cross-section. Since the error associated with DBH estimation was much larger than that associated with tree height estimation, we explored the reasons for this relatively large error. There were two major factors that decreased the accuracy of DBH estimation. One was the relatively low precision of the mobile LiDAR-driven point cloud data. Because mobile LiDAR data are less precise than terrestrial LiDAR data (Pierzchała et al. 2018), it was difficult to precisely determine trunk shapes (Fig. 7a). Another source of error was the combined effect of incomplete point coverage around the trunk and an irregular trunk shape (Fig. 7c). For instance, although tree p-1 shows incomplete point coverage in Fig. 7b, there is only a small difference between the measured and estimated DBH values. However, as shown in Fig. 7c, the tree DBH is overestimated when the data are incomplete and the trunk shape is irregular. The accuracy of DBH and tree height estimation was lower for park trees than for street trees. The main reason for this is that the trees were arranged differently along the street as compared to those in the park—those in the street were planted at regular intervals, while the trees in the park were distributed irregularly and clustered at specific locations. In the park, trees were more densely planted at some locations than on the street, meaning that increased foliage or branches blocked the laser from the mobile LiDAR in the park. Furthermore, rides and other facilities in the park also blocked the laser. 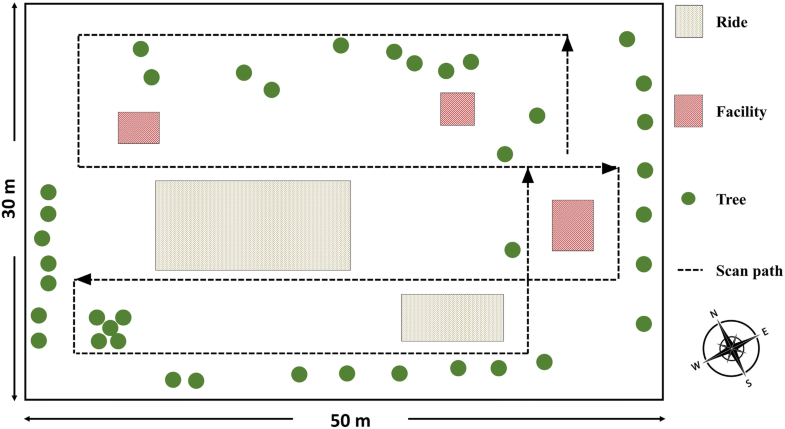 This means that many objects interfere with the uniform scanning of trees in a park, reducing point coverage around trunks, which in turn increases the estimation error (Fig. 8). In short, plant density is one factor that caused the low estimation accuracy for park trees. The highest estimation error occurred for tree p-16 because the data point cloud for this tree was concentrated at specific positions along the trunk. We calculated the heights and DBHs of trees along a street and in a small park using mobile LiDAR. The resulting tree height measurements were quite accurate, albeit slight underestimates, while the DBH measurements showed slightly larger errors. 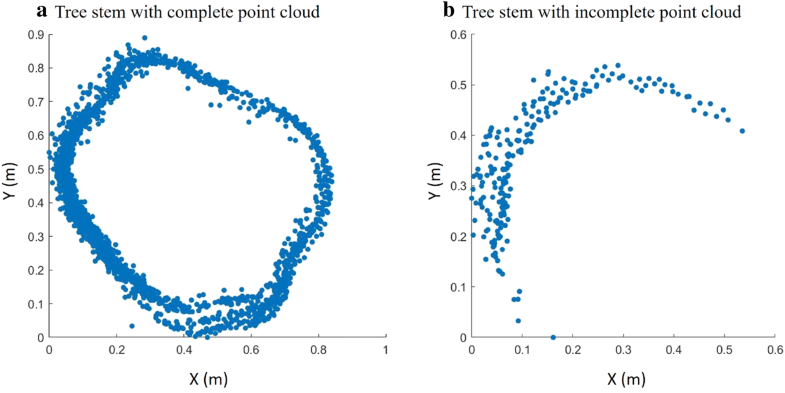 The difficulty involved in scanning treetops using LiDAR is the reason for the underestimation of height, while a lack of full data point coverage around the trunk and irregular trunk shapes caused the DBH estimation error. Differences between measured and estimated DBH values were higher for the park trees than for the street trees. This was because various obstacles in the park blocked the laser used in mobile LiDAR from reaching specific parts of some trunks. Overall, two additional changes are needed to improve the accuracy of LiDAR measurements of trees. First, the route taken through the area in order to scan the trees must be optimized to ensure that full data point coverage is achieved for each tree. Second, a method of calculating the DBH with high accuracy for irregular trunk shapes is needed. This study shows that it is feasible to obtain accurate data for trees across a wide area using mobile LiDAR. The resolution, measurement range, and accuracy of mobile LiDAR lie between those of airborne LiDAR and terrestrial LiDAR. These characteristics of mobile LiDAR mean that it can be used to measure tree DBHs (which is impossible with airborne LiDAR) and to accurately determine tree heights. In addition, it is possible to build a data set for a wide area, which is difficult to achieve with terrestrial LiDAR. Although this study did not cover a wide area, the results confirm that mobile LiDAR could be used to construct a city-level inventory. Data quality (such as point density and accuracy) will be an important issue when the method used in this study is scaled up. In addition, scanning a large area will require an increase in the speed at which the mobile LiDAR equipment is moved around the area of interest, which in turn will lead to a reduction in data point density. This potential problem will also need to be solved in order to construct a city-level inventory. This subject is supported by the Korea Ministry of Environment (MOE, project no. 2016000210004) as “Public Technology Program based on Environmental Policy” and by the BK 21 Plus Project in 2018 (Seoul National University Interdisciplinary Program in Landscape Architecture, Global Leadership Program Toward Innovative Green Infrastructure).